On May 15, 2009 we took Carl’s girls and their husbands to Italy for a family trip. I had written about the olive oils of Cinque Terra and the use of pesto in that region but now have time to write about a few hotels and other high lights. If anyone is on their way to this region of Italy you too can maybe experience some of the food and hotels that we did. The hotel we stayed at in Siena was called “Hotel Cerosa di Maggiano” this is a very expensive hotel but the food and space was well worth the money. Dinner in their dining room was A+, even if you do not stay in the hotel be sure and try and have dinner with them one evening. The next day we drove about 45 minutes to the village of Pienza and had lunch at a reataurant called ‘Il Rossellino”, in Pizza di Spagna” . The lunch was served by the husband and wife that own the restaurant. Every moment from entering the front door to our last sip of coffee was perfect. Our next stop was about another hour east, ” Hotel Locanda dell’Amorosa. Beautiful rooms, special pool and great gardens. The dinner was famous for the steaks of the region, this was a real case of bigger is better. The service was not that great but we enjoyed the experience and the men in my life had their fill of beef. We next went to visit our friends in the area of Parma. We dined in their home and spent time at the local markets. One high light was a tour of the parmesan cheese factory. The milk is brought to the plant in the early morning. the best milk comes from the brown cow that east the grass from the high hills above the Po river. We had the grand tour with our friend that has been involved in the industry of food from the region for years. 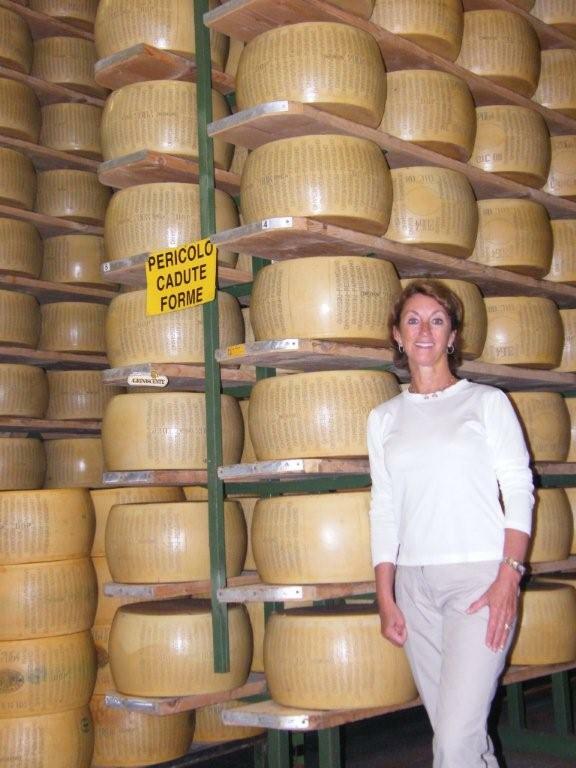 The best image is standing in the warehouse where the cheese wheels are stored for up to 4 years before they are shipped to the store to be sold. This warehouse holds over 3,000 wheels. Here the wheels are turned, every few months and tested for perfection. When you spend time watching the process we can all understand why every bite is so special. Try a bite with a drip of well aged balsamic vinegar. I hope some of you will have a chance to experience Italy soon. 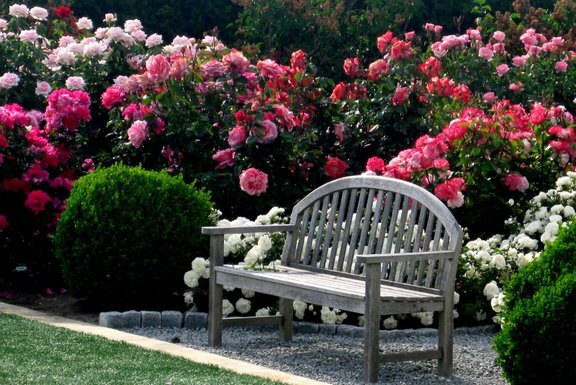 I have over 150 prize rose bushes and love the process of waiting each year for that first bloom. 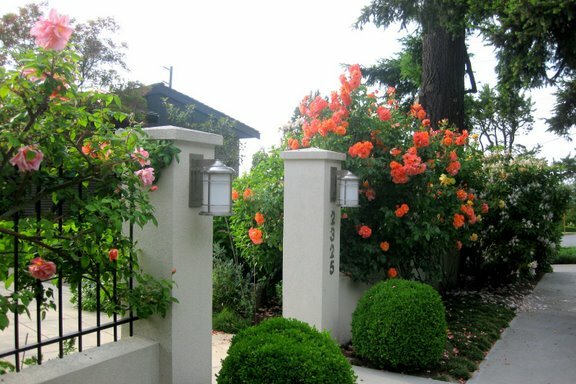 With the help of one of the best rose guys in the Northwest, Bob Gold, our roses thrive. I am posting a few pictures my sister took yesterday when the sun was very low in the early evening. 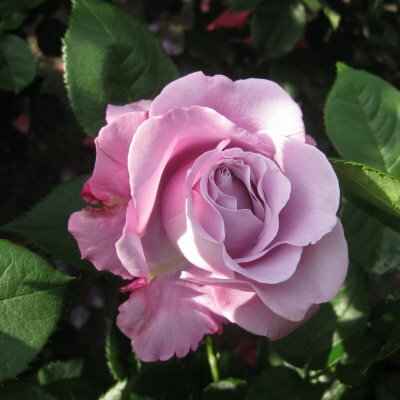 Because we have had such mild whether every rose has appeared like a perfect jewel. My husband and I spent time dead heading as the blooms fade and Bob comes by once a week to finish the job. The leaves are as perfect as the roses themselves. Hot Coco, Savoy Hotel, Fregrant Cloud and Wild Blue Yonder are a couple of my favorites this year. Hot Coco was new to the garden a couple of years ago and it has such a wonderful smell you just want to bury your nose in each bloom as it opens. 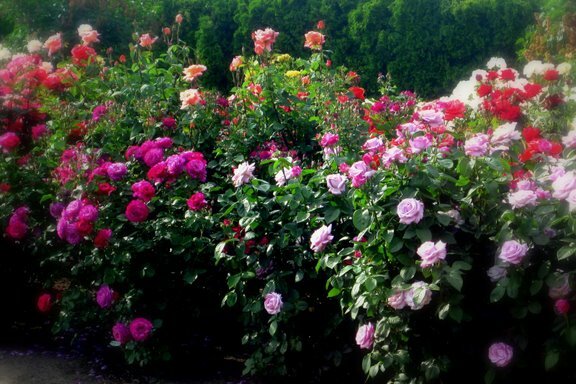 The pictures do not give you the full depth of the garden but maybe a glimpse. A sure sign of summer in the Northwest is the arrival of cherries in our markets. Washington is one of the largest producers of cherries in the country. We usually receive the large dark red cherries first, Bing cherries, followed a few weeks later by the light yellow cherry called Royal Anne. The cherries are still about $6.00 a pound so most of us only buy a few for that first sweet flavor treat. I know none of us need another gadget. However, while shopping at Sur La Table over the week-end I bought one of the best new gadgets for pitting cherries we have ever carried. If you go to http://www.surlatable.com and put in item number 636852 it will bring up our new 4 hole cherry pitter. This little box will hold 4 large cherries and with the push of the lid you will pit them all at once. Perfect for making a cherry pie or adding pitted cherries to a fruit salad. It worked every time and each cherry was perfect. It is also great for pitting olives large or small. The inside plate will switch to pit smaller pie cherries also. It really works, is easy to clean and locks to store. I have been working in my herb garden and have an update on the parsley hedge. Since we have had such warm whether in Seattle it seems that some of my curly parsley plants bolted. I have cut out the tall stems and hope that I can get it back in shape. Attached is the latest photo of the Italian parsley and the background shows the the artichokes coming on strong. I have more tarragon than you can use and all my friends are making the potato salad with green beans and tarragon in my new book. Look under recipes to find the recipe. If you have tarragon you will love creating the salad. I just want to let all of you know that my new book is getting great reviews. After being given the NPR award for one of the 10 best new cookbooks for summer several newspaper food writers have been giving some of the recipes fun reviews. I will attach a few recipes for easy summer dishes. The Rhubarb and Strawberry Crisp is a winner all the way around. Easy to prepare and so good to share with a scoop of vanilla ice cream. I am teaching a cooking class in the Sur La Table Kirkland store on July 11th at 10:30 am and would love to have any of you join our group. July 18th at 10:30 am, I will be teaching the class in the Portland Sur La Table store. You can go on and sign up for either class. The first week of our trip to Italy began with dinner in Santa Margherita. The famous pesto of this region covers perfectly small twisted pasta, Trofie, about 1½” long, made without egg. Basil from this region is tall with dark leaves making the flavor more powerful. The basil here is grown undercover, not in direct sun, giving it a pleasant citrus scent. Olive oil from this region is very light and fruity; the result is sweet oil. Liguria is one of the most prolific olive growing areas. Oil from this region is the most expensive. To be sure of the quality, look for a DOP – certified oil. This means 90% of the olives must be from Riviera dei Fiore. These two ingredients make the pesto of this region different from what you will experience any place in the world. We moved to the Cinque Terre the next day, to a small hotel in Monterosso, the first of five villages. Food once again had a local focus of fish, shrimp, pasta and pizza. The fish is fried if small, frito misto, or grilled if large. The shrimp come in several sizes and are simply prepared on the grill with lemon and olive oil. The pizza has a thicker crust with simple toppings. The local pasta dish here is the above mentioned trofie pasta, a few diced boiled potatoes and blanched green beans cut in pieces to match the pasta, about 1/½” long, quickly tossed with their famous pesto, and sprinkled with freshly grated parmesan cheese. This region is also famous for its pizza, focaccia and ice cream. The focaccia of the region is nicely browned on top, the dough softer in the center with crisp edges. Pesto here consists only of light Ligurian olive oil, pine nuts, fresh garlic and a blend of cheese – 50% pecorino 50% aged parmigiano reggiano – blended in a mortar using local hothouse basil (www.surlatable.com) search key word mortar & pestle (Carrara marble) $65.00. Note about great olive oil and unique vinegars. These prized ingredients often cost $50 up. We will spend this amount for a bottle of wine or several shared during a meal. A special bottle of great oil or vinegar will often last a month or more and is well worth the investment (www.surlatable.com) click food. We drove inland to the area around Siena. We spent two nights in the most beautiful chateau, “Hotel Cerosa di Maggiano”, a Relais and Chateaux property. In this region, your meal starts with a selection of thinly sliced meats, perfect tomatoes, fresh mozzarella cheese and a dish of olives from the area. The wines of the region are a broad selection of great reds. Tuscany offers Chianti Classico and Brunello at every restaurant along with each village offering local wines from small growers. The area around Cinque Terra is famous for white wines. The Liguria region being close to the sea has more fish and pasta, less meat in their diet.